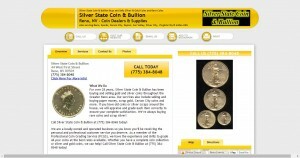 Silver State Coin & Bullion address, phone, website, hours of operation, and more. For over 28 years, Silver State Coin & Bullion has been buying and selling gold and silver coins throughout the Greater Reno area. Our services also include selling and buying paper money, scrap gold, Carson City coins and more. If you have old coins or silver scraps around the house, we will appraise and grade each item correctly to ensure your complete satisfaction. We’re always buying rare coins and scrap silver!